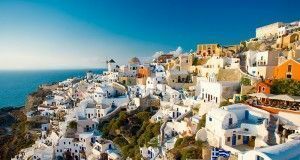 Guide with the BEST to visit PERISSA SANTORINI this 2019 with excursions and accommodations in which to sleep. Perissa is a village located about 15 km southeast of Fira. It is a very tourist town full of people and has a impressive and long black sand beach. The most outstanding part is the Vouno Mesa, a huge rock that rises from the sea. 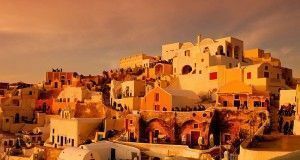 This area of ​​Santorini offers a excellent night view when the rock lights come on. El village of Perissa It stretches along a stretch of coastline and beach south of Santorini, in the middle of the arch of the half moon that forms the island. The village of Perissa is not really a village, but rather a tourist city, populated only during the summer holidays. The town offers a wide variety of hotels and rooms, taverns, restaurants, cafes, bars, beach bars and nightclubs. The area is newly built and It has been created solely for the purpose of receiving tourists, which explains the architecture, which is very different from the other villages, which are much more traditional. From Perissa, there is a small footpath that crosses the mountain and leads to ruins of ancient Thera. The excursions can be done both on foot and on the traditional donkeys. The village of Perissa is also the home of the lovely chapel of Agia Irena (16o-17a centuries). 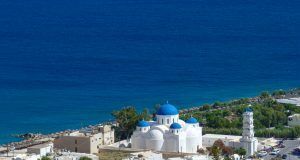 The distance to Fira, capital of the island is not very big, 14 km, but as in Fira the majority of tourists who arrive on cruises to see the island in one day, Perissa seems more family, and ideal for sleeping with children. The beach of Perissa is black sand, of volcanic origin and reaches as far as the eye can see, with 8 km that allow us to get lost while walking. The beach of Perissa extends until merging with the one of Perivolos, where you dance day and night. The current of wind that enters Perissa makes it refuge for lovers of windsurfing, water skiing and other water sports. In summer, especially in August, Perissa boils with the number of tourists arriving, but the rest of the year is a much more peaceful beach. 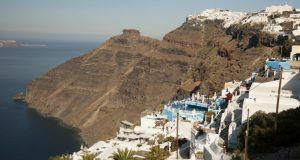 One of the Santorini campsites can be found here, and although it is more modest than Fira, it allows you to have the beach a few steps away. The church of Timiou Stavrou which is located in Perissa Square is one of the largest on the island and next to the ruins of the Byzantine Basilica of Agia Irini (V century AD) that are ascending Mount Vouno are the two cultural excursions of the town.